Unlimited Maduro is a full-bodied masterpiece, draped in an absolutely gorgeous Broadleaf maduro wrapper that glistens with natural oils. A quick peek beneath the sheets reveals the real meat and potatoes – a lovely San Andres binder and a bold mix of Honduran and Nicaraguan long-fillers. Think we’re done? Oh, hardly. Flavorful, feisty, and expertly crafted, this premium handmade will take you on a journey through notes of leather, coffee, cocoa, and spice, all complemented by a slightly sweet, slightly peppery taste. It’s rich. It’s satisfying. 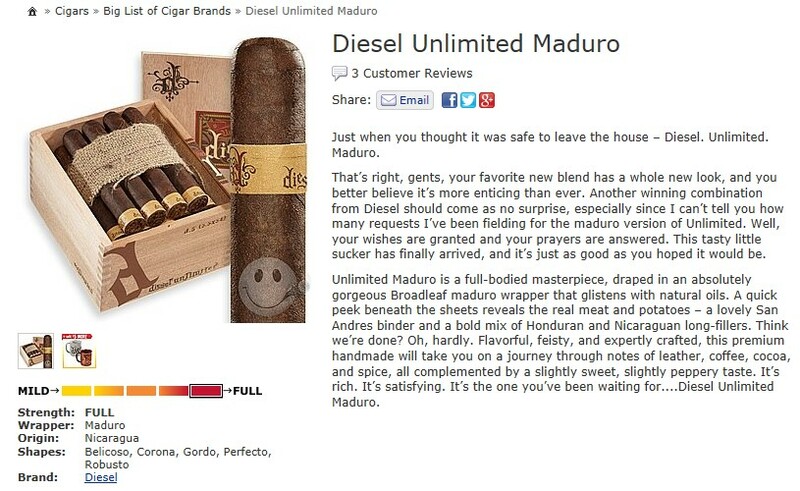 It’s the one you’ve been waiting for….Diesel Unlimited Maduro.